If you were on the Internet in 2000, you may remember John Titor, a message board poster who said he had traveled back through time from a post-apocalyptic 2036, ravaged by World War III and the collapse of federal government. Titor, as it turned out, wasn’t real. But he stuck in people’s heads, and he makes a central appearance in the most unlikely of places: a Japanese visual novel named Steins;Gate. Steins;Gate, which offers no in-game explanation for that gratuitous semicolon, came out in the US yesterday for Vita and PS3. (It’s been out on PC here for a while.) After hearing endless raving from colleagues and visual novel fans across the world, I finally played through it over the past few weeks, via an early copy provided by the game’s publisher, Pqube. In just over 20 hours, I beat it all, then went back again to get the true ending, because it wouldn’t be a visual novel without a true ending. The first thing you have to know about Steins;Gate is that it’s excruciatingly slow. American fans of visual novels like Danganronpa and Virtue’s Last Reward might be used to stories that, while not exactly blistering, at least ramp up the conflict right away. In Steins;Gate, the first two chapters are solely devoted to setup, and things don’t really start picking up until the third. By the end of chapter five, though, you won’t be able to put the game down. The second thing you have to know about Steins;Gate is that it’s as pure a visual novel as it gets—the only decisions you’ll make over the course of the game are how to respond to e-mails and whether or not to pick up the phone when it rings. A few of those decisions will affect which of the six endings you get, but there are no puzzles or interactive elements to be found here. This is a game for people who want to read. The third thing you have to know about Steins;Gate is that it’s suuuuuuuper anime. There are a ton of tropes and creepy jokes, and while the writing is really sharp—kudos to the English localization team for a remarkable job—there’s only so much you can do to improve on archetypes like Ditzy Cosplay Girl and Fat Otaku Pervert. Rintaro Okabe, the main character, is delusional and often irritating, and you might find yourself wishing at times that you weren’t stuck inside his head. The fourth thing you have to know about Steins;Gate is that if you don’t mind the first three things I just mentioned, it’s really goddamned good. 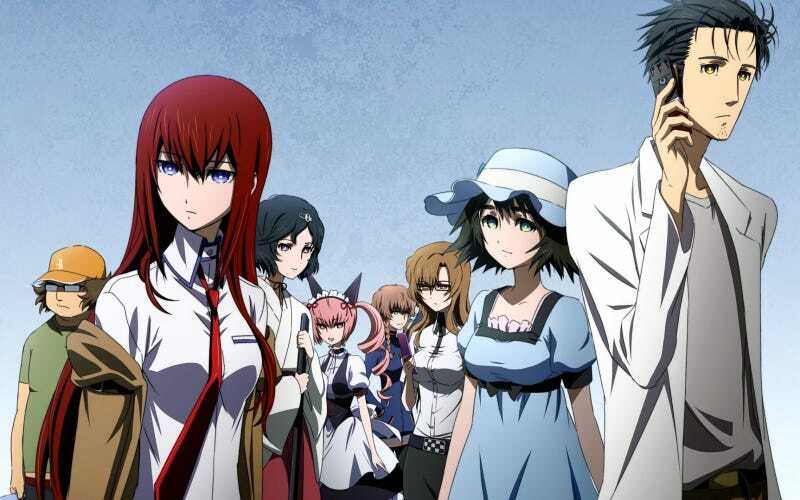 All of the characters—even Okabe!—grew quite a bit on me over the course of the story, which is full of weird science psychobabble and incredible moments, driven by questions about time travel and the relationships between Okabe and his various friends. The premise of Steins;Gate revolves around Okabe and his friends accidentally inventing a time machine and figuring out how to deal with the consequences of that. For the first few chapters, they spend a lot of time aimlessly wandering around and trying to figure out what’s happening and what they should do next. Then, there’s a turning point, and as the story kicks into gear, it gets really excellent, touching upon time travel, evil organizations, the story of John Titor, and, of course, the power of love.